As noted before, “farm fresh” is often an oxymoron. Things found in barns are usually anything but fresh. Today’s example, a number of old feed sacks — burlap feed sacks , to be precise. 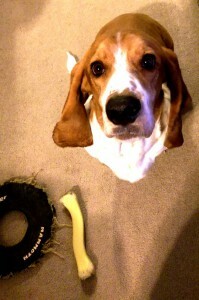 While our dog, Sir Oliver T. Puddington, really loves how dirty and smelly farm fresh finds are, I prefer to clean them! While the graphics can be real beauties, they lie beneath layers & clumps of stuff that is not so beautiful and smells — like dirt and, yes, manure. 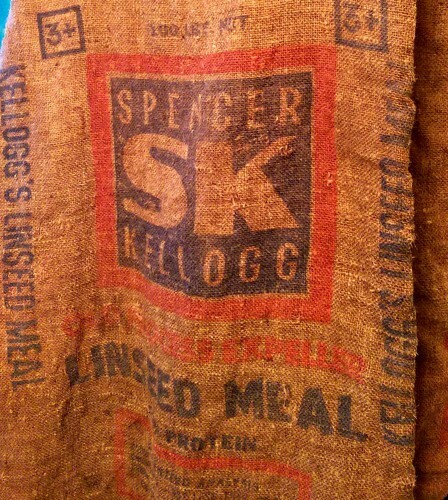 In order to be of any real value, the vintage and antique feed sacks must be cleaned. Instead, you must hand wash them — and, due to their size, one at a time at that. While the old feed sacks I cleaned today are made of burlap, you can clean other feed, seed, flour, sugar sacks etc. in the same way. As these old seed and feed sacks once held product (and also may have been used for lots of other purposes) there’s always some icky stuff left inside the sack. Stick your hand into the bottom of the sack and turn it inside-out. Shake it gently to remove any leftover contents. And then follow-up by using your hand (preferably gloved!) to wipe away anything hiding along the seams of the sack. Once satisfied that you’ve removed everything, stick your hand in again and pull upwards to return the sack right-side-out, so that the graphics are again on the outside. 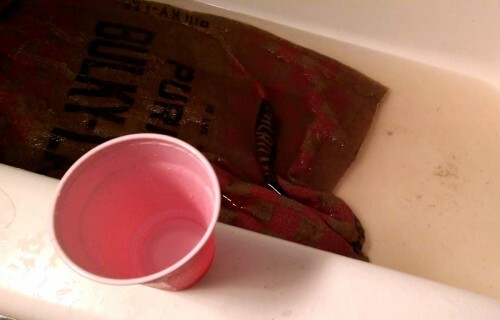 As soon as I start the warm water running in the bathtub, I take a single feed sack out and begin by holding in beneath the running water. I do not plug the tub yet as because many of the clods of dirt an manure will require pressure to come off. Since we are without the pressure of our handy lawn hose today, the pressure of the running water from the tap will have to do. Once the majority of the big pieces are off, I set the wet feed sack on an old towel while I wash the mud and farm fresh dirty pieces down the drain — being careful to catch any twigs, rocks, or other large pieces I do not want to pass into the drain and clog it. 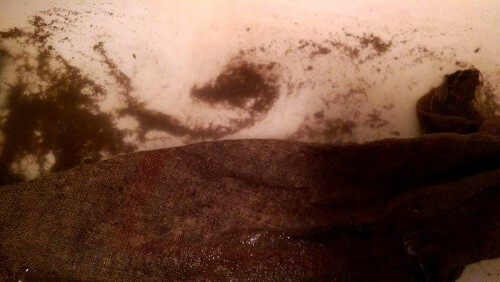 I toss the twigs and other pieces in the trash and rinse the tub a bit so that it is clean enough not to turn the running water brown right away. Next, I put the stopper in the bathtub and begin filling the tub with warm water. As these sacks are pretty dirty, I only use warm water at this point. Usually the water turns instantly brown again, but I continue to swish the sack gently around in the water to dislodge more dirt. As you swish and rub, look for holes, spots, etc. Avoid unnecessarily pulling on the holes and tears while working to remove the spots. Typically, I repeat this step at least two more times so that the water bears just a slight tint of brown and few, if any, clumps of stuff. Then I proceed to flip the sack inside-out again, and give the inside a rinse.You’d be surprised how much remains on the inside, even after three rinsings! If that is clean enough to not require repeating, I flip the sack back so that the graphics are outside and give it one final rinse. Now, finally, it is time to proceed to washing with soap. This sack is on it’s fourth rinsing and just about ready for Step Four. Bonus: Murphy’s Oil leaves a more natural and non-offensive scent, which means the cleaned primitive farm advertising piece is much more like it should be — and isn’t now a perfumed piece that annoys those looking for primitive items or mantiques. Once you add your previously-rinsed old seed or feed sack to the soapy water, you’re likely to see much more of the brown than you’d imagined could possibly be left. You can let the submerged textile soak a bit in the soapy water, if you’d like. And then come back and gently swish it around and rub spots as necessary. As the tub drains its filthy water, I run the tap with warm water again and rinse out the sack. Once you are satisfied with how clean it is, you can remove the old farm advertising sack from the water and gently wring it to remove the excess water. Once you’ve got as much water out as you can from wringing it, lay it flat on a large beach or bath towel and roll it up so that the towel can absorb more of the water. You may have to do this more than once, with a new clean & dry towel each time, as these large old feed and seed sacks can hold a lot of water. Sadly, after all this work, there sometimes are spots left. You can wash them again, as needed. Sometimes I still find a few seeds that have worked their way into the seams and fabric weave as well. As a buyer or collector, you likely will need to wash your new acquisition again. Even when dealers like myself clean the items, it’s more for presentation than the final act; we know items will be handled in the shop and we remove the “ick factor” but other shoppers do handle the items, including laying them on the floor to inspect them and the like. So whatever textile you buy, you ought to be prepared to launder it yourself for use or display in your own home. It is especially important to note any holes, tears, or weak spots before you ever even consider using the washing machine. With finer gunny sacks, or sacks with lighter colors and finer weaves, you may need to do some additional cleaning on spots. More on that at a later date as my back is sore from all that time bent over the tub! 6 Responses to "How I Spent My Afternoon: Cleaning Old Feed Sacks (A “How To” Guide!)" My mother gave me a vintage 50 pound flour sack that was in beautiful condition, which stated “donated by the people of the United States of America.” One of my husband’s friends found it in a drawer in my kitchen while I was traveling and used it as a dish towel and then washed it on hot before I returned, removing most of the printing. Can these be restored with a special cloth paint, or is this piece of Americana ruined forever? Oh, Angela, I feel your pain! You could try to repaint it; but it would be a repaired piece, which would lower the value. However, if this is “just for you” and you want to restore it to display conditions, then why not go for it? 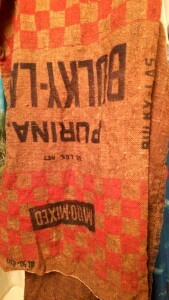 Just gave my old Farm Bureau Mermash bag a wash. Used a gentle bar soap with warm water. The ink started coming off where I gave a light scrubbing with my hand. I ended up just soaking in warm water, gently ringing out and hanging to dry. BE CAREFUL. That old ink washes out easier than you’d think.